Australian Customs and Border Protective Service, Border Force and Immigration and Quarantine Services. 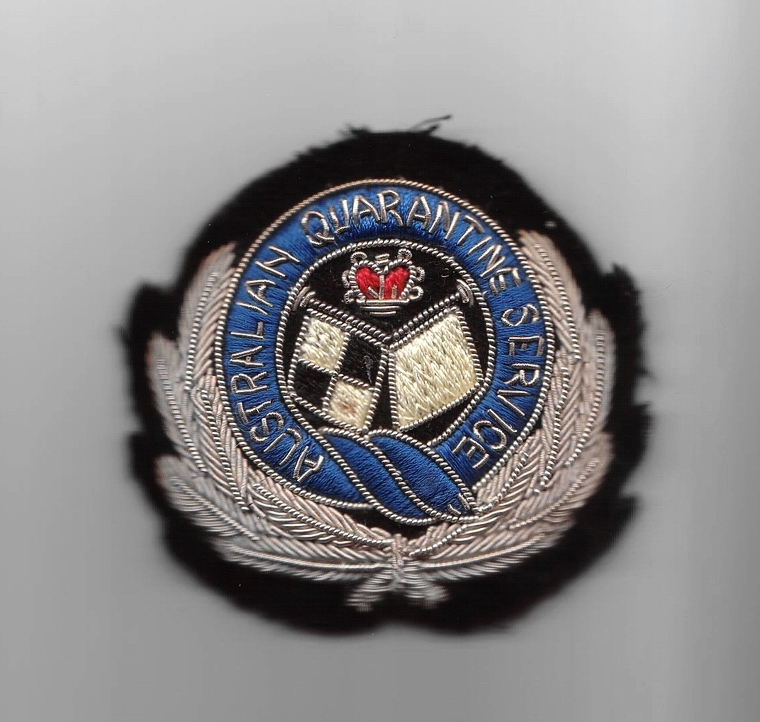 The "Commonwealth" and "Australian Customs and Border Protection Service", "Australian Department of Immigration and Citizenship" , "Commonwealth" and "Australian Quarantine and Inspection Service" badge and "Border Force" history. Note: The Australian Coat of Arms and current "agency" names are Copyright © Commonwealth of Australia. HRH "The Queen's Crown" ("Saint Edward's Crown") is Copyright © The Royal Household, and its use, granted solely by Royal Warrant. 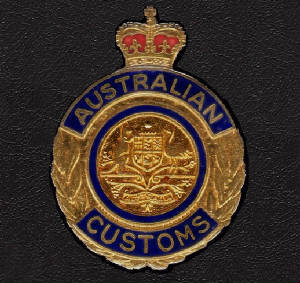 Commonwealth Customs King's Crown hat badge. A two part badge made by WITTENBACH Melbourne and AMOR Sydney. First used c 1915 on caps and even worn on "hard hats" by S.P.O's, until c 1965. Extremely RARE. 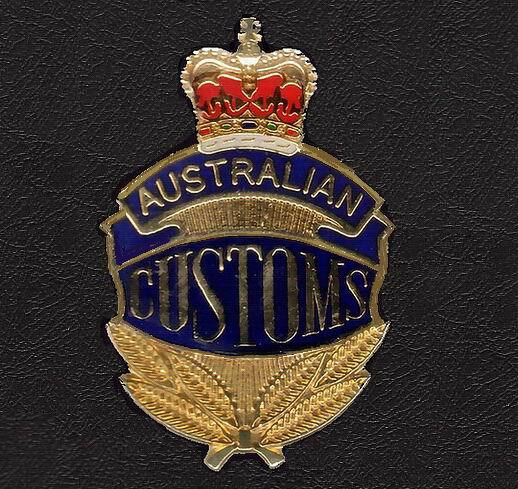 Commonwealth of Australia Customs bullion badge. Issued c 1930/40. There is also a version with a "red" centre. One known owner. *One of the Rarest. 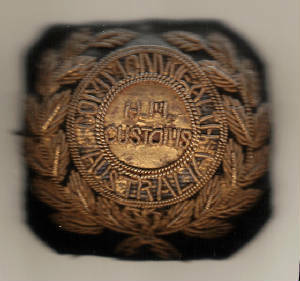 The first metal, Customs hat badge that replaced the bullion badges; known as the "Mary Jane" or "Bus Driver's" badge. This was not a popular badge because, some say, the "laurel" looked like "cannabis" leaves. Some officers apparently refused to wear it. Withdrawn after about a year in service. Hallmarked "Brim. Melb." c 1982. Very Rare. 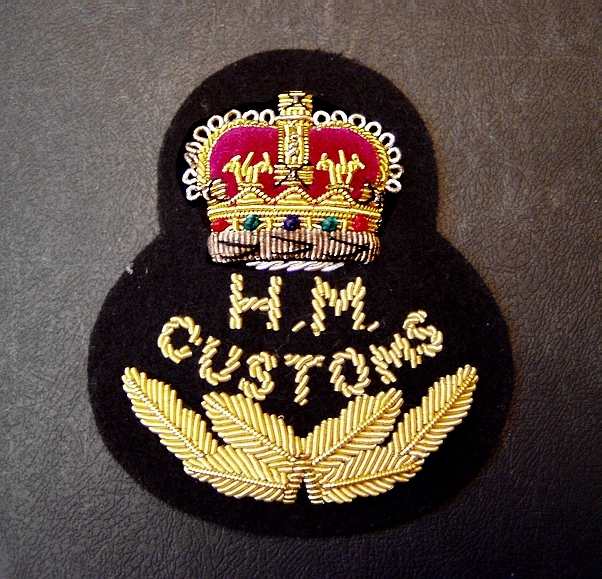 The first "Female" version, issued Customs badge; with a pin back for use on blouses or shirts with no pockets. Issued c 1982. Withdrawn due to no "plinth number" and defective "pins". Very Rare. Commonwealth and Australian Quarantine and Immigration Service. 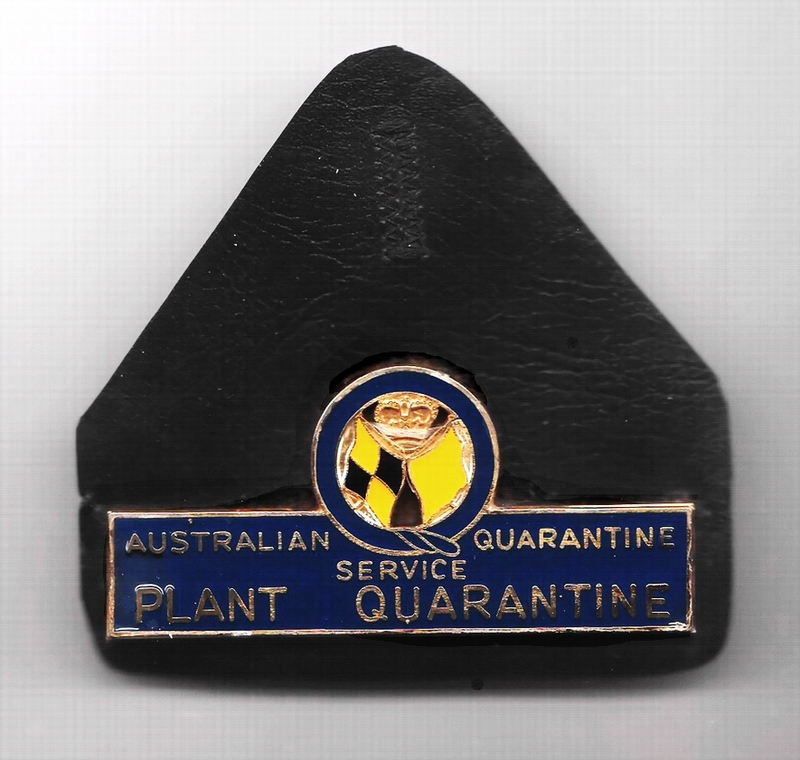 Australian Quarantine Service "Plant Quarantine" fob badge. c1980 - 1998. Numbered on reverse. Rare. Commonwealth Customs Bullion badge. 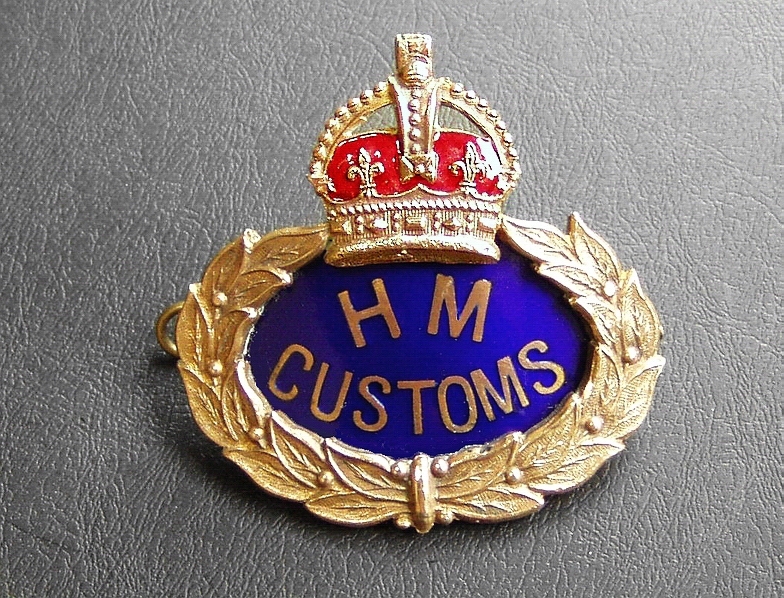 Issued on the new uniform cap in c 1965 with two metal and enamel "HM Customs" lapel badges. Scarce. 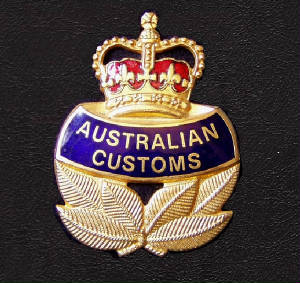 The second style, Australian Customs hat badge that replaced the "Mary Jane" version (see left); used for newly issued "wide brimmed style" hats made by Mountcastle. c 1982. Scarce. 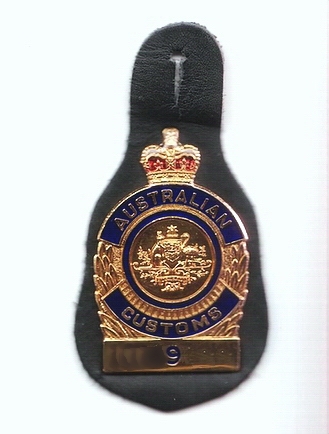 Australia Customs, second version, Female badge; with "numbered plinth". c 1983 -1998. Rare. Note: Fictitious number on badge. 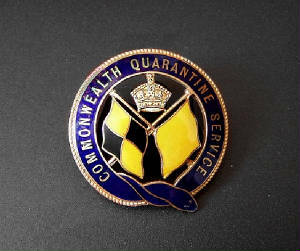 "Australian" Quarantine Service, bullion "Senior Officer's", Queen's crown, cap badge. c1960. Very Rare. 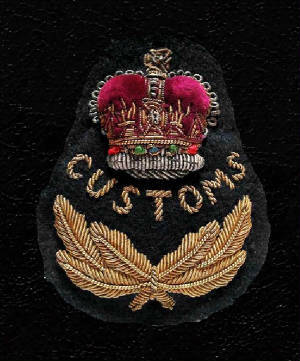 Commonwealth Customs "Officer's" Bullion badge for forage caps. 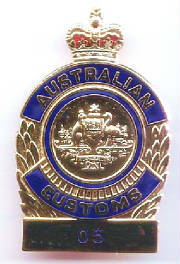 Australian Customs "Blue Stripe" Fob badge", which quickly replaced a similar badge that looked like it was a design fault; in that it was issued with just a "plain white" panel/plinth. Also issued in a "female" version. c1975 - 1982. Rare. 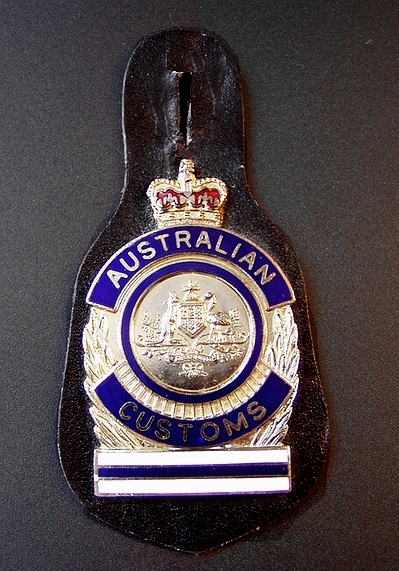 Australian Customs "Numbered" Fob and ID badge. The prefix digit of the number applied to the "State" of issue (based on the Post Code system; except Canberra badges began with "1" The number was normally 4 digits and then some were issued with 5 digits. There is also an Extremely Rare "D" plus number version. c 1978. Recalled in June 1998. Scarce. 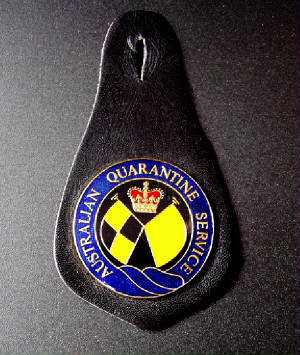 "Australian" Quarantine, Service Queen's Crown Fob or "tear drop" badge. c 1980. Numbered on reverse. Rare.